When you think of the best first class products in the world, Emirates is probably high on your list (if not at the top)! 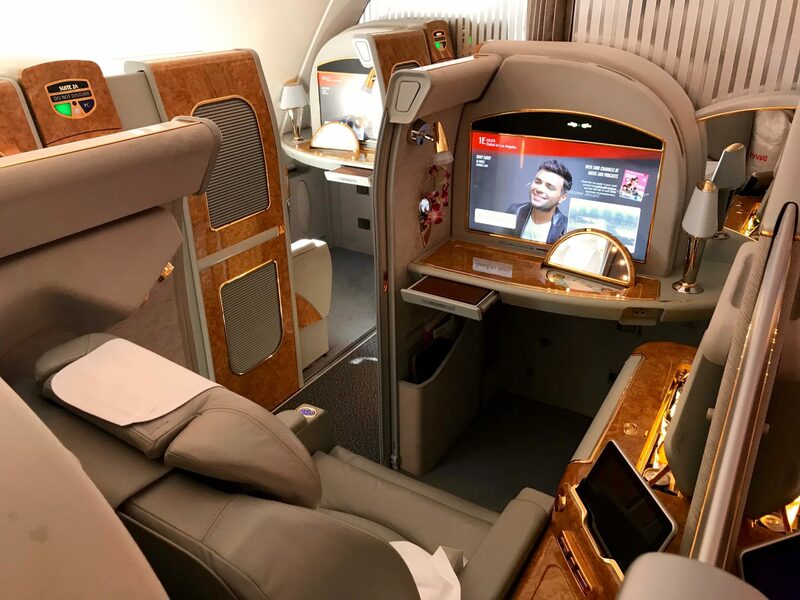 Without a doubt, Emirates offers one of the most luxurious seats in the sky, and flying first class on this airline is an experience you won’t want to miss. From the amazing Emirates first class suite to the champagne or the shower spa, you’ll be flying like royalty. To top it all off, you’ll have access to an actual inflight bar where you can enjoy a drink or snack and chat with your fellow passengers. Before we discuss how to book an Emirates first class flight, let’s take a look at exactly what you’ll be booking. When Should You Search for Emirates First Class Award Space? 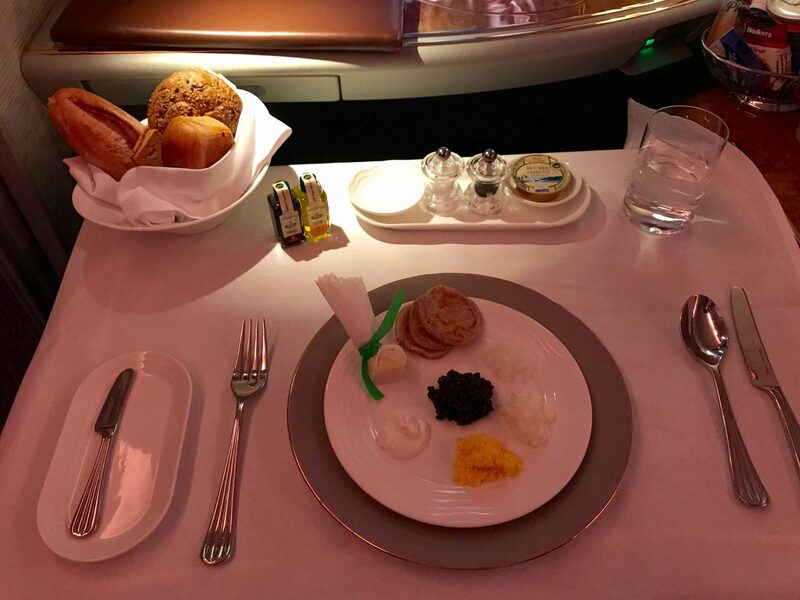 What Makes Emirates First Class Amazing? There’s nothing quite like enjoying the glamorous first class experience on Emirates. Let’s start with your first class suite, complete with a mini-bar, bed, and a door for privacy. Those doors close with just the push of a button. You read correctly: individual motorized doors on an airplane. And that’s only the beginning of the Emirates first class experience! There’s nothing like having your own personal Emirates first class suite. You even have your own mini-bar. Don’t worry, champagne is provided on request! Image courtesy of Upgraded Points. Emirates raises the stakes with their fine dining experience to keep you well-fed. From champagne to spirits to fine wine, your flight attendant will ensure you always have a nice drink to go with your meal. Experience fine dining at 30,000 feet in your Emirates first class suite. You might be wondering what kind of champagne. Well, this is first class on Emirates, and they really spare no expense. You’ll be able to enjoy a glass of world-renowned Dom Perignon. 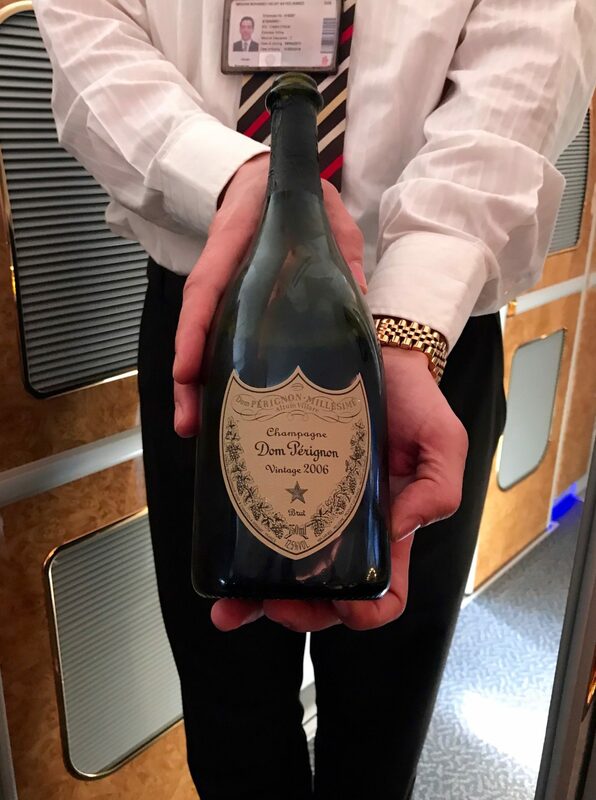 The Emirates first class experience wouldn’t be complete without a glass of Dom Perignon! Your flight attendant will be happy to pour you a glass (or 2). Is this the best first class experience? Perhaps, although that will depend on your personal tastes. It’s certainly up there! Now that you have a taste of Emirates first class, let’s discuss how to book this flight so you can have some fun! While Emirates does have their own frequent flyer program, in this case it’s not the best option (and certainly not the best value) for booking this flight. We’ll discuss more below. In November 2017, Japan Airlines Mileage Bank imposed huge fuel surcharges for awards on Emirates, in addition to the miles cost. For trips from the U.S. in Emirates first, these can be as much as $1,716! If you decide to book an Emirates award, then consult Japan Airlines’ distance-based chart. The more miles you actually fly, the more Mileage Bank miles it will cost. A new devaluation is apparent on the new JAL Partner Award Chart. Image courtesy of jal.co.jp. As you can see, the award chart is broken into tiers based on the total trip distance. If you fly multiple segments, you’ll need to consider the distance of each segment. This chart presents some sweet spot award booking opportunities for Emirates first, which we’ll discuss a bit later. Search with Qantas for award flights that don’t touch the U.S. If you’re planning an Emirates first class trip, Japan Airlines Mileage Bank will likely cost you the fewest miles. Make sure you give them a look! Don’t forget to check out other amazing redemptions with the Japan Airlines Mileage Bank program. 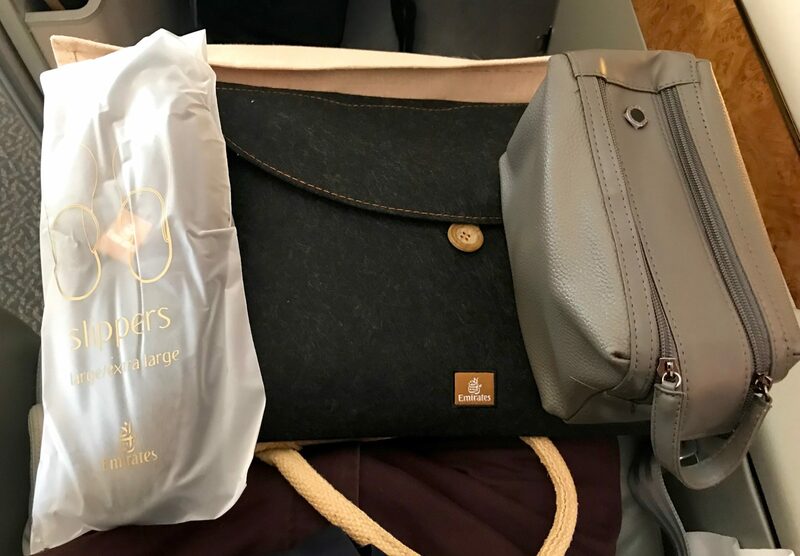 Until Alaska Airlines massively devalued their Emirates award chart in early 2016, using the Alaska Airlines Mileage Plan program was the go-to way to book first class awards on Emirates. Not only are these award prices much more expensive than using Japan Airlines’ Mileage Bank program, but your point of origin or destination must be in the U.S. The biggest benefit Alaska possesses is that it is the only realistic way to fly without paying fuel surcharges in excess of $1,700+. So in that sense, it can definitely be worth it to use Alaska miles for Emirates first class. While Alaska Airlines might not be the go-to program for Emirates anymore, Mileage Plan still provides some other amazing redemption options. 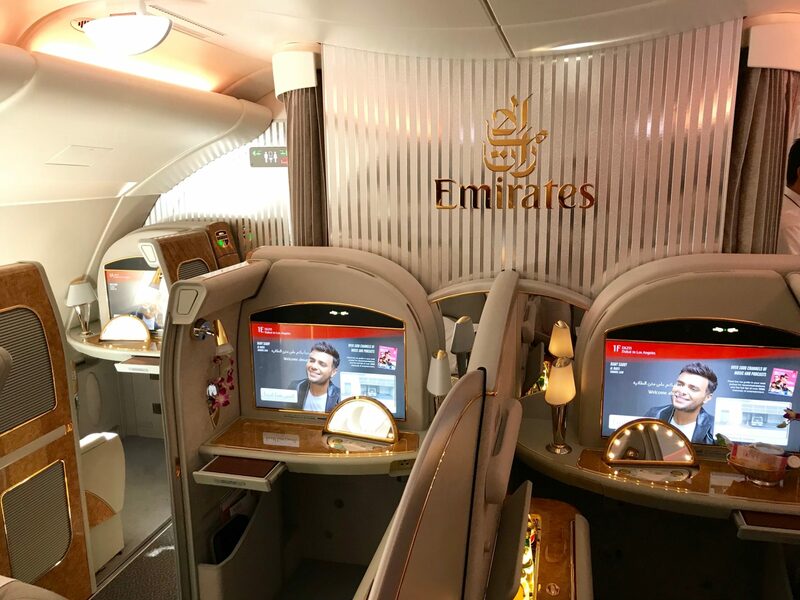 While most people would not consider using Skywards miles to book Emirates first class a worthwhile option, we actually believe the Skywards program can be valuable to a specific set of people. Specifically, if you want to try out Emirates’ chauffeur service and truly live “the Emirates first class experience” — including the flight, chauffeur service, and amazing lounge — then it might be worth it to use Emirates Skywards miles. Emirates is a transfer partner with both American Express Membership Rewards and Marriott Bonvoy, while JAL and Alaska are only transfer partners with Marriott. So while JAL and Alaska don’t have any way to rack up miles fast, American Express Membership Rewards will definitely help you boost your point balances to book first class! Unfortunately, you will still be responsible for carrier-imposed surcharges. But if you book round-trip awards, you’ll be able to leverage stopovers! Pay with your miles and any additional taxes and fees. Qantas and Korean Air also partner with Emirates. Korean Air isn’t great anymore since it’s no longer a Chase Ultimate Rewards transfer partner, and their booking process is quite difficult. Qantas has a ridiculous award chart (in addition to taxes and fees), so we definitely don’t want to use them here, except maybe to search for award availability outside the U.S. The Dubai to Los Angeles route is actually one of the longest flights in the world — plenty of time to enjoy the glamour of an A380 Emirates first experience! Emirates flies to several other U.S. airports with their Boeing 777. These routes still provide the same first class suite and perks, but you won’t get to experience the shower spa and inflight bar. While Japan Airlines will require fewer miles, a round-trip first class award from the U.S. to Dubai will include up to about $1,716 in taxes and fees. Alaska will require more miles, but won’t impose fuel surcharges (which keeps the out-of-pocket cost lower). Hot Tip: Check out our in-depth guide for a full list of Emirates’ routes to/from the U.S., including plane types, cabin, and seating options. Bank of America provides both personal and business versions of co-branded cards with Alaska Airlines that will earn you additional Alaska miles. You can earn Marriott points and transfer those to Japan Airlines, Alaska Airlines, or Emirates at a transfer rate of 3:1. Plus, for every 60,000 Marriott points you transfer, you’ll receive an extra 5,000 Skywards miles bonus. You can earn American Express Membership Rewards points and transfer them to Emirates at a 1:1 ratio. Unlike airlines such as Cathay Pacific and Lufthansa, Emirates does not have a regular schedule for releasing first class award space to their partner airlines. 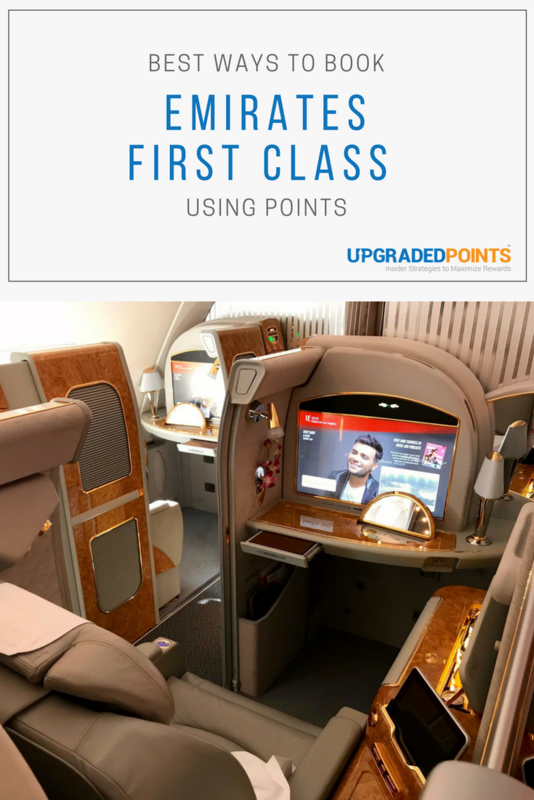 That being said, Emirates first class is a highly sought after award ticket, so you should start searching for space as soon as you have an idea about your travel dates. The more flexibility you have with your travel dates, the easier it will be to find space and book your Emirates first class experience! Your Emirates First Class Lounge experience is sure to get your travel day started on the right foot. 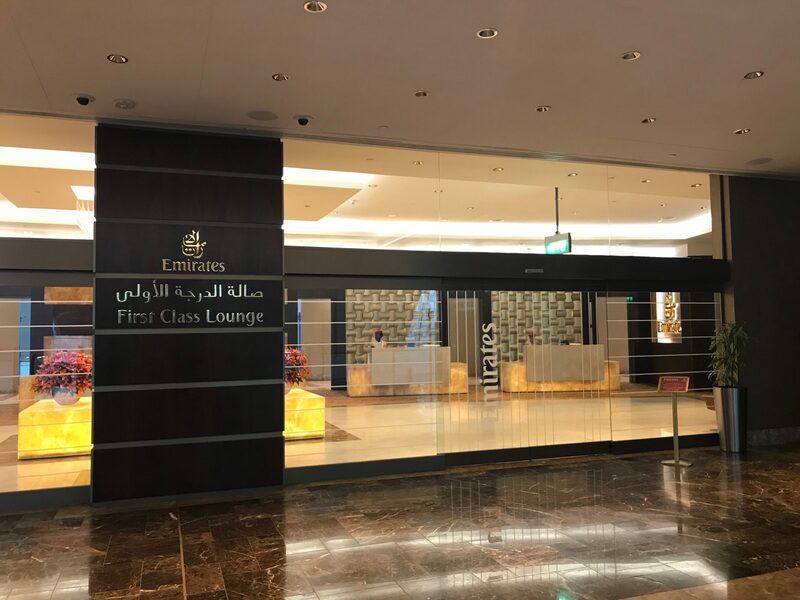 When departing from or transiting Dubai International Airport, you will have access to the Emirates First Class Lounge. If your flight is on the Emirates A380, you will be able to board your flight directly from the lounge. You’ll find areas dedicated to entertainment, dining, and even families with children. There really is something for everyone in the Emirates First Class Lounge. Emirates has amazing lounges in other airports around the world too, including in New York City (JFK), where you can also board your flight from the lounge. 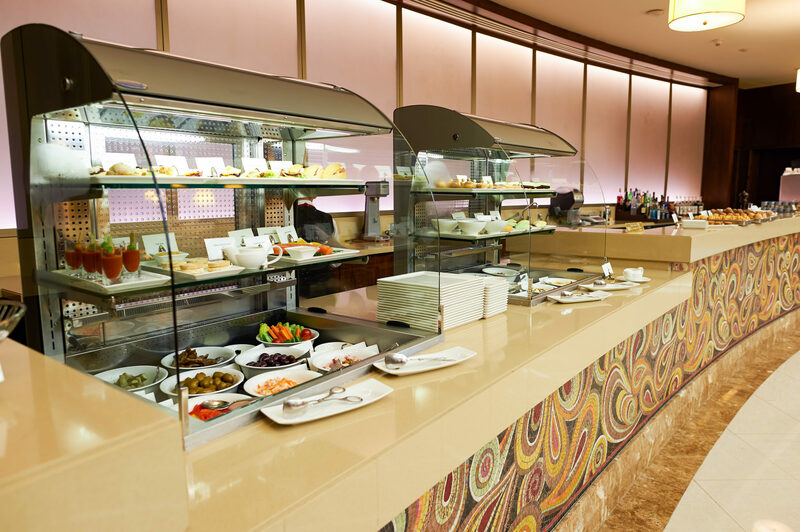 Whether you want a full meal or a snack, you will be happy in the Emirates First Class Lounge and during your flight. From start to finish, your first class experience will include fantastic food and beverage choices. In the Emirates First Class Lounge, you have the option to enjoy snacks from a buffet or order a meal in the dining area anytime you’re hungry. You’ll also enjoy on-demand dining on your flight, so you can eat when you are ready. As we mentioned above, fine champagne and other drinks are available as desired. 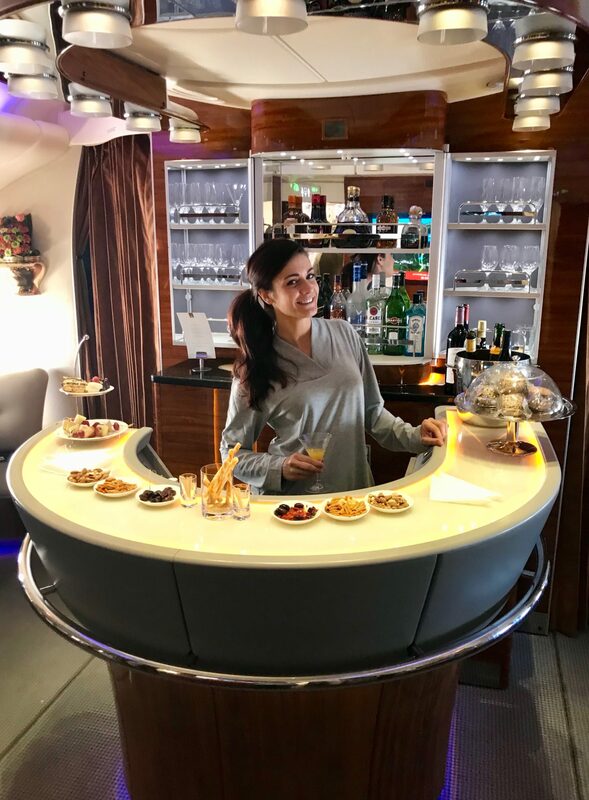 Enjoy a drink, a snack, and the company of your fellow premium cabin passengers at Emirates’ inflight bar on the Airbus A380. One of the most well-known features of Emirates first class on their Airbus A380 is the inflight bar. Located at the rear of the business class cabin, first class passengers are welcome to enjoy the company of fellow passengers and have a drink. You can even bring your Dom Perignon champagne with you! This is a fantastic way to stretch your legs and add a little fun to your flight. 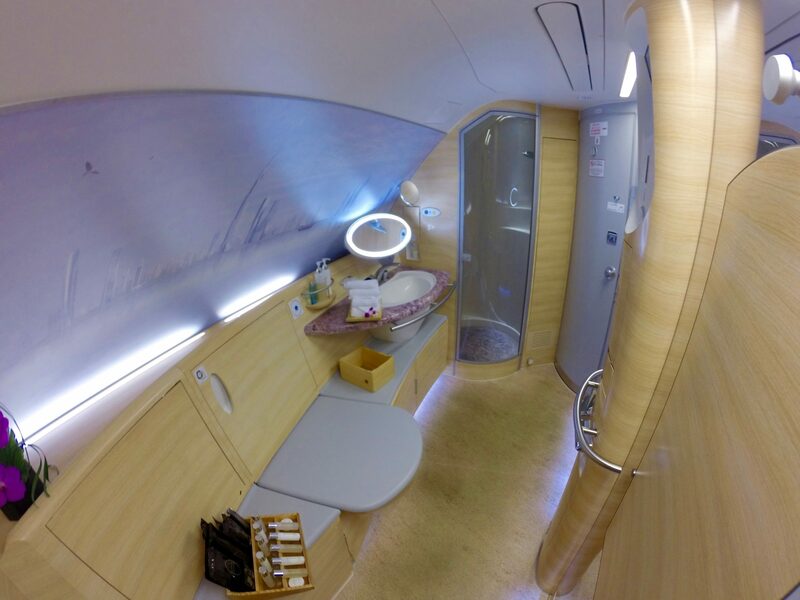 A shower at 30,000 feet is pretty unbelievable — and in a space like this, it’s definitely comfortable as well. Emirates first class passengers can also enjoy the First Class Shower Spa. You will have access to the room for 30 minutes, with 5 minutes of hot water in the shower. During your spa experience, you might notice that your feet are warm…that’s because the floor is heated! After a long flight, this can be just what you need to freshen up before an adventure. Slippers, pajamas, and a luxury amenity kit help you rest easy during your journey. To top off the first class experience, Emirates provides an amenity kit with high-end Bvlgari products and pajamas (to keep) so you can relax comfortably during your flight. Enjoy Emirates chauffeur service when booking awards with Emirates Skywards miles only! Image courtesy of emirates.com. If booking awards with Emirates Skywards miles, you’re eligible to book a complimentary chauffeur service in business or first class. You’ll be transported upon arrival or prior to departure if you’re within a qualifying distance from the airport you’re flying out of. It’s clear that Emirates first class is an experience any traveler will enjoy. While these flights retail for tens of thousands of dollars, you can use Japan Airlines Mileage Bank program to score an amazing award ticket. Like with all award bookings, make sure you check for award availability before transferring points. Remember to start your search for award space as soon as you’ve narrowed down your possible travel dates to increase the likelihood of finding Emirates first class award space. Now that you know how to book Emirates first class, what are you waiting for? Get out there and take flight in one of the most amazing first class products in the sky! What is the best way to book Emirates first class? 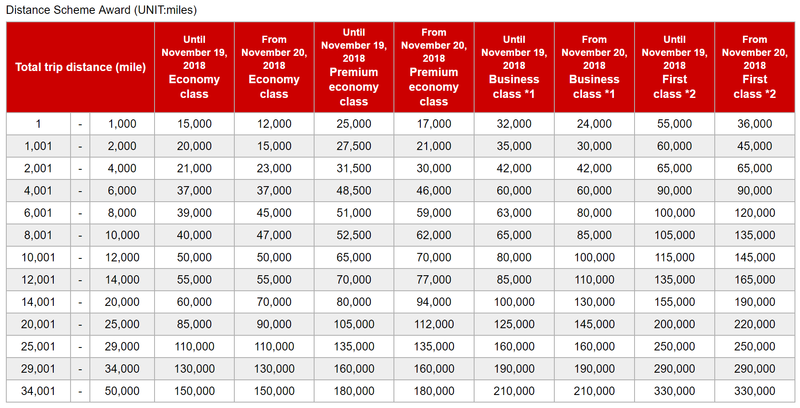 Right now, the cheapest way in miles to make a first class Emirates booking is with Japan Airlines Mileage Bank miles, though with large cash surcharges. If you have a ton of Alaska Mileage Plan miles, they can be a solid backup option. What do I get when flying Emirates first class? When you fly Emirates first class on the Airbus A380, you’ll enjoy a comfortable suite with a lie-flat seat. Additionally, you’ll have 30 minutes to use the first class shower spa. To top it all off, you can enjoy the inflight bar at the rear of the business class cabin. Don’t forget the Dom Perignon champagne! Hi Jenni! Booking Emirates First directly with Emirates by transferring from Amex will cost you a LOT of points (and taxes). For example, a one-way flight from JFK > MXP would be 85k miles & ~$548 (see here). If you login to Emirates.com you can find out how many miles it would cost for your journey which is what I’d recommend doing if you’re set on using Amex points. If not, definitely use JAL miles as it’s a lot cheaper, especially the further you travel. Hi Alex, Nice post on this about Emirates. I loved my one time flying Emirates direct to Dubai. I was wondering the best option for a person like me to use points from Amex Gold Rewards to fly on Emirates first class. You say Japan Airlines would be best to transfer to and to use on Emirates. What would some good options for me to go on any destination considering I start off at O’Hare? You stated its not a good idea to fly to/from the US. Please help me with any ideas as I am new to using points and would like to take advantage of them to any destination. Thanks! Do you still feel that Japan Airlines Mileage Bank is the best way to book award tickets on Emirates First Class Cabins? Are the showers available on all their planes? Yes, Japan Airlines is still the best ways to book EK F! Only the A380 plane has showers on it, the 777 unfortunately doesn’t but the seats are a little larger on the 777 and the cabin is more private due to having fewer seats than the A380. For me, it’s A380 every time due to the bar and the showers! Great article. Emirates F is a favourite of mine, and many of our Australian readers use Qantas points to book it, simply because Qantas points are so easy to earn and burn here. 1) Qantas is the only airline scheme other than Emirates Skywards that provides access to Chauffeur Drive on points bookings – a nice perk. 2) By commencing an Emirates journey in Hong Kong (even after the Nov 1 lift in restrictions around carrier surcharge) carrier surcharges can be avoided completely. As an example, I flew HKG-DXB-ATH-DXB-ADL last year, all in Emirates F, and paid around $80. Good times! 3) While long distance flights require lots of points, it is possible to get a taste up the pointy end on a short distance route at a reasonable price. For example, the fifth freedom route of SYD-CHC comes in at 54,000 points, which many will think is decent for a 4 hour jaunt (complete with 4 course meal, Dom, Hennessy Paradis and shower time). Hey Adele! Thanks for reading. You bring up great points! We’re going to include your feedback in our comments so that Qantas-loyal readers can utilize your knowledge. Thanks for your comments!